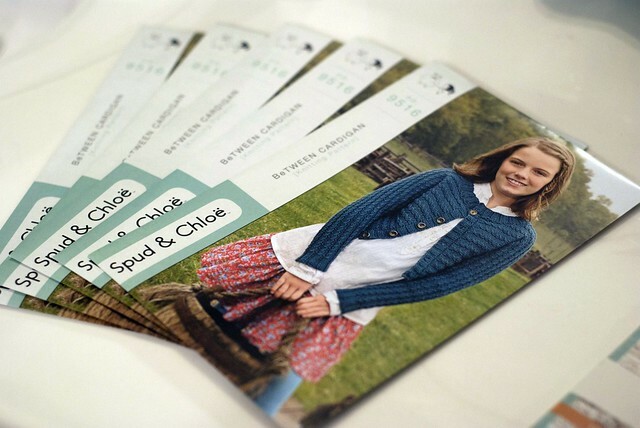 The always fabulouse Spud & Chloë sent me a few copies of my new pattern! I can’t tell you how excited I am to have a pattern published with them, and they are just a seriously wonderful company who treats their designers really well. Honestly, it’s been a dream to be able to do work for them and I was so excited to see these patterns in person and get to hold them in my hand and to see my design up on their website. So to celebrate, I am giving away 1 copy of the BeTween pattern (as seen above) along with 1 skien of the exact same yarn and dye lot I used to make this sweater, it’s the left over skein in Spud & Chloë Sweater that I did not need, which is enough to make a easy and quick winter hat. To enter you have two chances and you must come back here to let me know you have done both (comment twice if you do both!). Friend me on Facebook, or re-tweet this give-away! All entries must be in by Thursday December 16th Midnight EST. I’ll announce the winner Friday. Be sure to include your e-mail in your comment so I can contact the winner! Update: Comment #22 was the winner! Congrats Em! I added you on Facebook! Thanks for the contest! Also facebooked you! Thanks for the giveaway! Also, I like you on FB. And I “like” you on Facebook!! What a great prize! I just knit up some Spud and Chloe Outer for the first time today and it’s so nice, I would love to knit with some Sweater too. I liked and RT’d. Spud and Chloe I just love love everything they do.I liked you on facebook and tweeted you too. Good luck to me love the pattern! You rock. I am a wife, and a new mom ( she’s 7 months ) Love your kid stuff! I facebooked you. Thanks for the giveaway. I LOVE this sweater! I “like” you on FB! Thanks! Great yarn and pattern. Consider yourself re-tweeted and thanks for the opportunity to be entered in this contest! I “liked” you on facebook. I didn’t see a way to friend you. I hope it worked! I just “liked” you on facebook. I’ve been meaning to do that for a while, so what a nice opportunity to be reminded. These are so sweet! What a good idea. And I also like the snow falling on your blog. We live in Kentucky and have had way more snow than my parents in Pennsylvania this year. My boys are delighted. Just love these little mitts. Gonna make a pair for my 3 yr old granddaughter. She will love them!! !